It has been described as the world’s most unlikely, most remote and most dangerous party town in the world. Vang Vieng, in the landlocked communist nation of Laos has been in the news quite a bit in recent times, mostly because of the increasing number of young people becoming dead there. It certainly is a unique place.It is the home of the sitcom bars. If I were to make a lazy guess (and I will) the staff of the original ‘Friends’ bar in the middle of town, which has played nothing but ‘Friends’ daily on an endless loop for about 15 years, would by now have been subjected to around 200,000 episodes of the American sitcom. This alone would certainly not be good for one’s health. It was also, until relatively recently home to numerous opium dens, which have officially been closed down by the authorities, though any bar in town playing reggae music instead of TV sitcoms generally devotes the final few pages of its menu to opium, mushrooms and marijuana (if still in any doubt, any blackboard advertisements inviting passers-by to come in, relax, and have a nice sleep on their comfortably cushioned communal furniture should be a dead giveaway). My favourite of these bars is in the middle of town, where the music is always very laid-back. The proprietor is a very nice fellow who spends his days strolling casually about the bar, gently tapping people on the shoulder to ask how everybody is feeling. I get the distinct impression his primary concern is that his patrons remain breathing. The menu offers takeaway items also, such as a one-kilogram bag of weed for the bargain price of 2,500,000 kip (roughly 310 American dollars). Of course, there is very little a tourist could do with a kilo of weed besides get themselves into a very large amount of trouble. Everyone is on the take here. “Of course we have a happy menu!” she exclaimed, smiling once more, and produced the single laminated A4 sheet from thin air, before sitting down to explain the ‘rules’. She told us that opium and lime do not mix well, so we should perhaps not have, for example, a gin and tonic for lunch. She went on to explain that the obvious and serious side-effect of combining opium and lime is death. She wandered away happily, returning a few moments later with a steaming mug of opium tea for my friend and a Beer Lao for me. She wished us a pleasant breakfast then curled up on some cushions in front of a small TV and went to sleep. The other waitress was also asleep. None of the few patrons in the restaurant seemed to mind. Nobody was in any kind of hurry. Perhaps it was all the opium. Suddenly the fact that hundreds of young backpackers are arriving each day to this beautiful, exotic South-east Asian destination to sit indoors for hours on end and watch TV sitcoms (the ‘Friends’ bar is just one of many – there are two identical bars just around the corner whose only difference is which episode is playing at any given time. There are also a number of ‘Family Guy’ bars) does not seem so ridiculously bizarre. 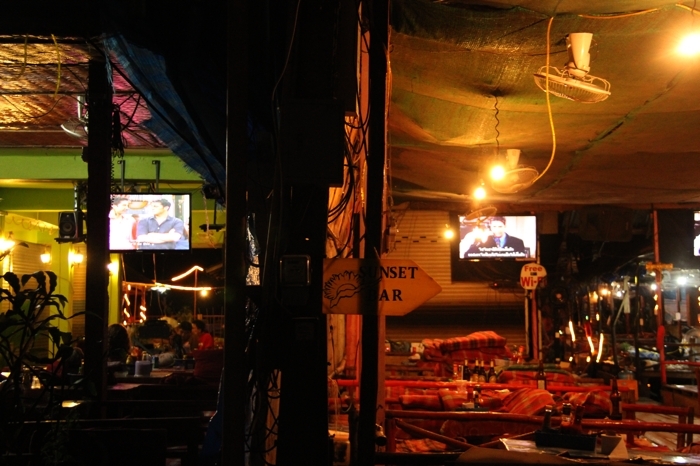 And, as all visitors to Vang Vieng know, the sitcom bars are very much the sideshow after (or before) the main event. There’s no reason to get too paranoid however when getting wasted in Vang Vieng. Several bars and restaurants kindly alert their valued customers as to what time each evening the ‘happy’ orders will be temporarily unavailable, while the ever-vigilant police arrive to conduct their random drug inspections.All this talk of drug-addled laziness is not to say of course that illicit drugs are not strictly prohibited in the Lao People’s Democratic Republic, which of course they are. Notices are duly posted at tourist accommodations throughout the town (most accommodation is of the budget variety – the average age of the Vang Vieng tourist seems to be about twenty), explaining that drugs are strictly prohibited, and often helpfully inform visitors of the places to avoid when purchasing their drugs. These notices also generally inform visitors of the fine (bribe) payable to police if or when you get caught. At the time of writing, the going rate for avoiding Lao jail-time is five million kip (a small fortune in Laos, equal to about US$620). And so it goes. Everybody’s happy, and everybody’s getting paid (at least everyone who counts). They certainly do look like a happy bunch, and are easily the most laid-back Communists around. I haven’t been to Cuba as yet, but as far as straight-out kickbackedness goes, the Laotians (in my experience) have the Chinese, Vietnamese and even those zany, fun-lovin’ North Koreans completely beat. Funnily enough however (actually, not funny at all really), it isn’t actually the ready supply of drugs and alcohol that has given this constantly growing non-stop party it’s dark reputation – well, not directly at least. No, what has led Vang Vieng to be described as the world’s most dangerous party is the tubing. Previous articleEnough Already with the Spitting!